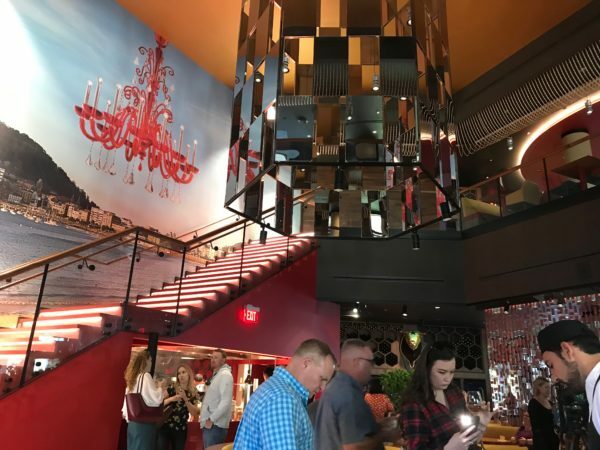 Jaleo by Jose Andres opened in Disney Springs’ West Side on March 17th. 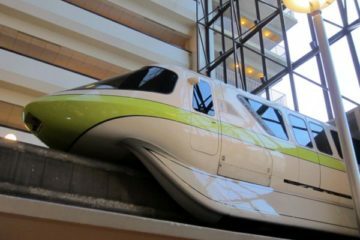 This is the fifth location of its kind in the country, but this one is the biggest yet. This multi-level table-service restaurant has a formal yet contemporary design, but it has a relaxed, casual feel. 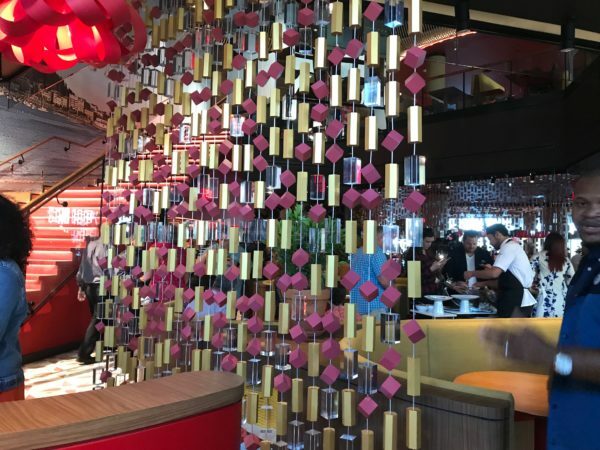 The restaurant, which combines booth and table seating, is colorful and bold elements with cool features like a foosball dining table. 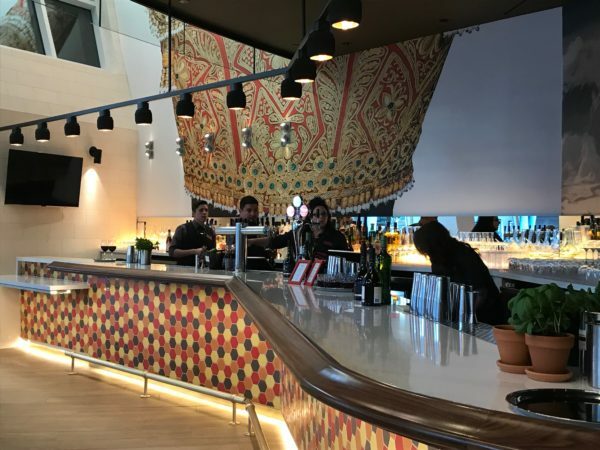 There are on-stage kitchens, bars with seating, an outdoor patio, and even a Jaleo Academy area upstairs that can be booked for special demonstrations and wine pairings. 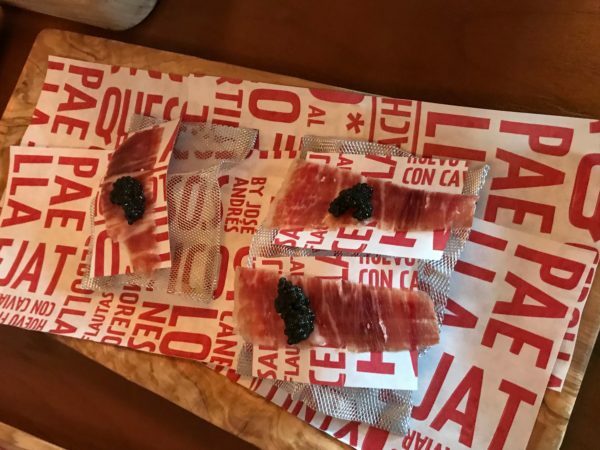 Welcome to Jaleo by Jose Andres! 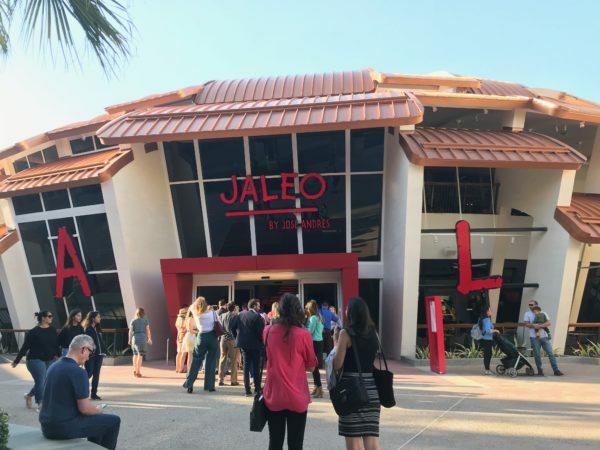 This is the fifth and largest Jaleo location to date! The Jaleo waitstaff was attentive and helpful! 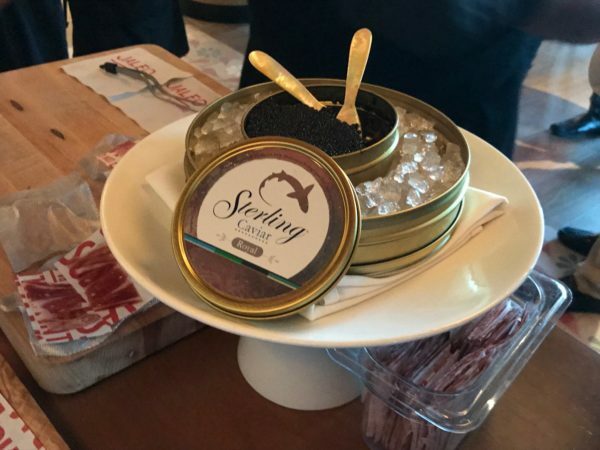 I attended a media event on March 21st and witnessed this culinary marvel in action! 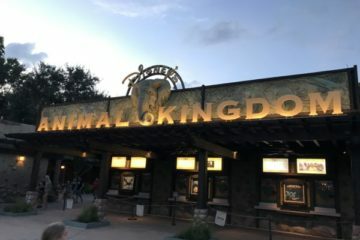 While the event featured an abbreviated menu, a full menu will be available within a couple of weeks of opening. From the moment you enter Jaleo, you’re treated to a visual party! 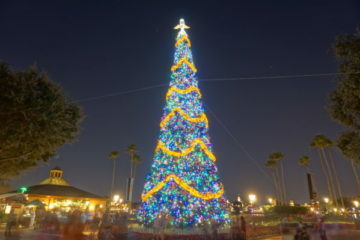 Look up, look down, and look all around. Every square inch of this restaurant has received first-class treatment! Jaleo is both formal and whimsical at the same time. 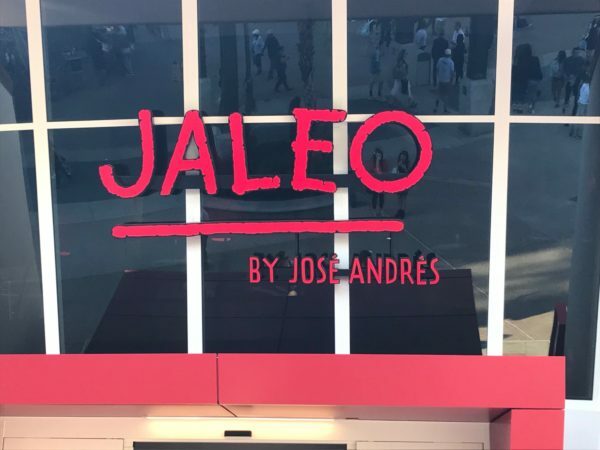 Let’s take a look at the new Jaleo by Jose Andres in Disney Springs! Jaleo has a variety of wines by the glass and by the bottle. The house wine is Cuvee Jose Raventos Blanc. It’s a white wine and is really good! Jaleo also has a variety of cocktails from sangrias, gin & tonic, margaritas, and more. Every one of these drinks has a special twist. For example, the Pomada mixes gin, bergamot, mint, and soda for a mojito vibe. The Token, which is Cachaca, Mexican Coca Cola, Lime, Angostura bitters, and nutmeg is like a rum and coke with a twist. The Salt Air Margarita doesn’t have the traditional salted rim but instead is topped with a saltwater foam. The story is that Andres was swimming in Spain when he got some foam in his mouth leading him to think it would make for a great drink. 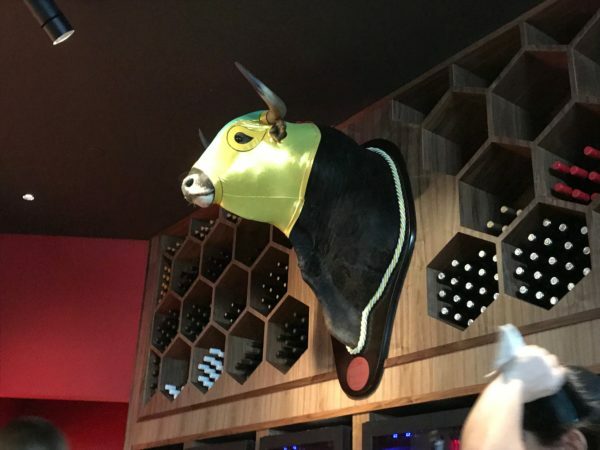 Jaleo by Jose Andres has a full bar and lots of unique drink mixes! There are plenty of non-alcoholic drinks on the menu. The featured one is Kas Limon, which is like a unique lemonade with soda and lemon. Put simply, the food at Jaleo is incredible. Many of the diners at the media event have commented that Jaleo could be the next “best restaurant” in Disney World. 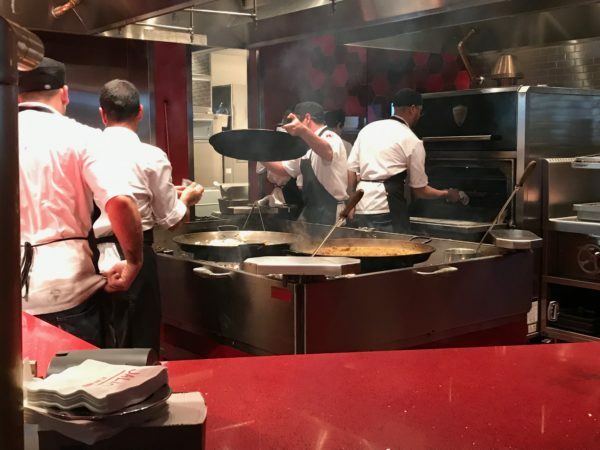 This on-stage kitchen works hard to prepare paella throughout the day! There are a lot of chefs in the kitchen! One of the coolest parts about this restaurant is the huge woodfire paella pit. 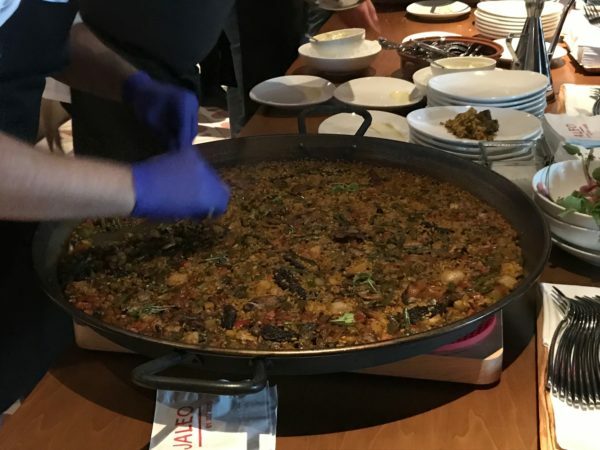 The chefs will make two paellas per night – one vegetarian and one meat. 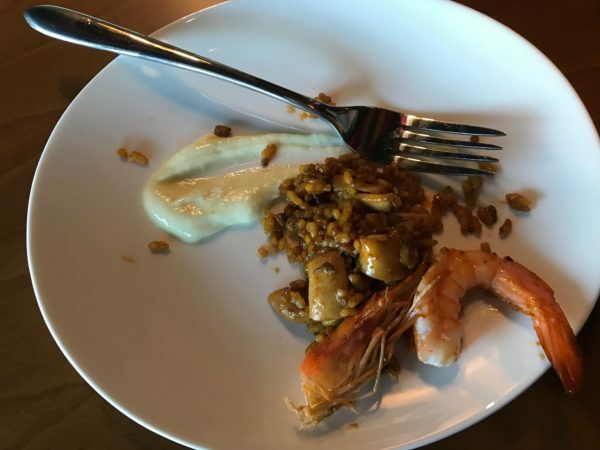 Jose Andres, a native of Spain, introduced authentic Valencia-style paella, which is a dense, dry dish made with rice-like grains and a variety of other ingredients. 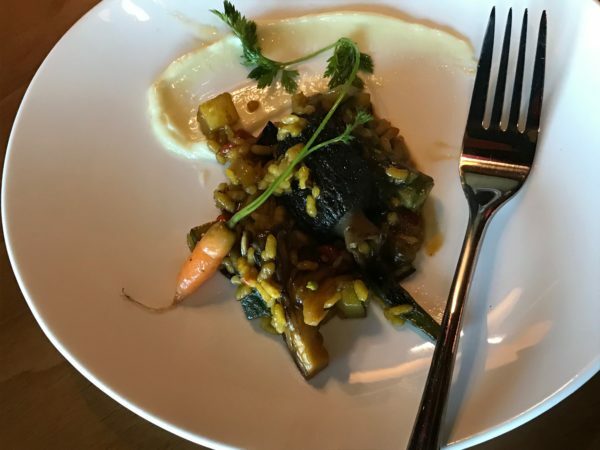 Currently on the menu is Arroz de verduras y setas de Temporada with veggies and mushrooms but not meat and the Paella Valendiana, which is made with chicken, rabbit, lima beans, green beans, and saffron. Paella takes a long time to prepare (like 45 minutes), but it’s worth the wait. When you order it, the wait staff bangs on a drum and yells, “PAELLA! !” really loud, which makes for a really fun atmosphere. The paella is made in massive skillets, and it can take around 45 minutes to prepare! 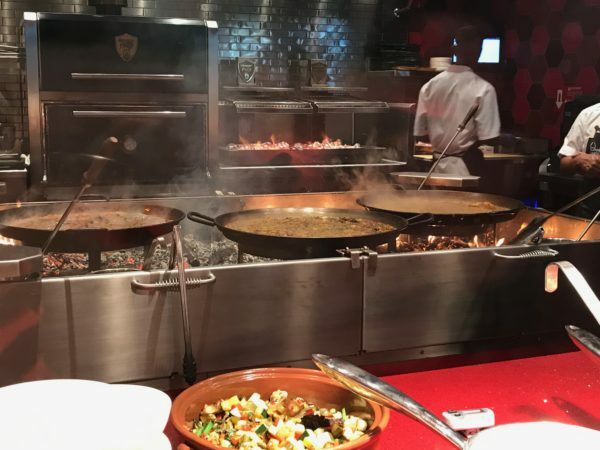 From skillet to plate, here’s what paella looks like when it’s served to hungry diners like you! Ensalada de Remolacha co Citricos: red beet salad with orange, grapefruit, blue cheese, pistachios, and sherry dressing. There are also some tapas on the menu include Gambas al Ajillo, which is shrimp with garlic sauce. 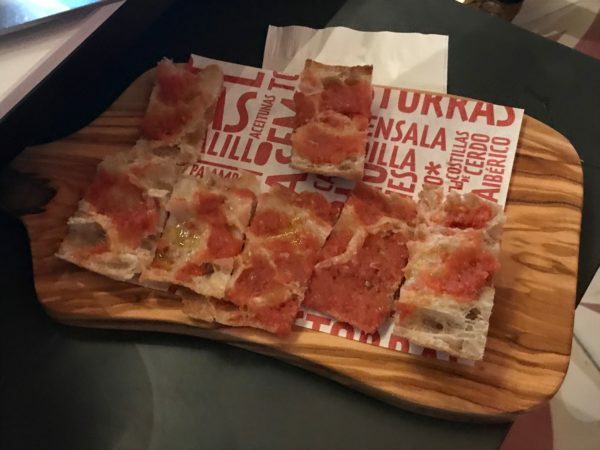 Pan de cristal con tomate is like pizza! 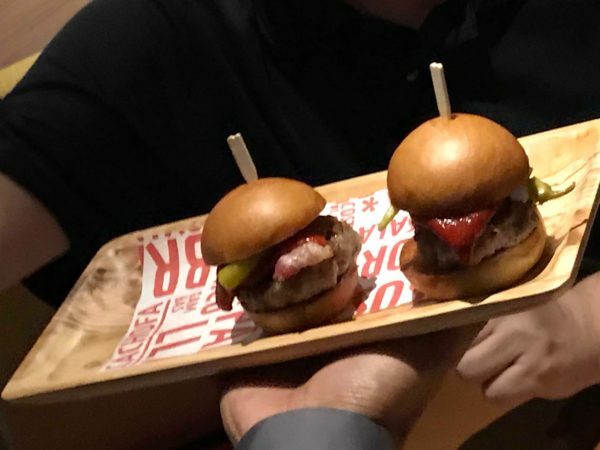 These sliders are perfect for sharing! Jose Andres is known for being a little eccentric, and one dish that displays this at Jaleo is the Croquetas de Pollo, which is just creamy chicken fritters. 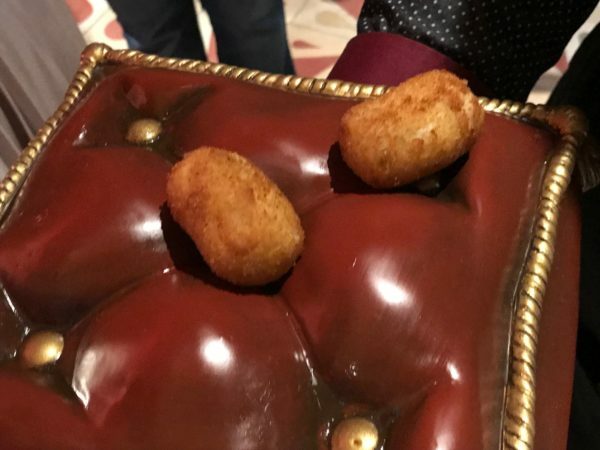 What makes this dish unique is how it’s served: on a pillow. The story goes that Jose once left his shoes on the table, and his grandmother yelled at him. 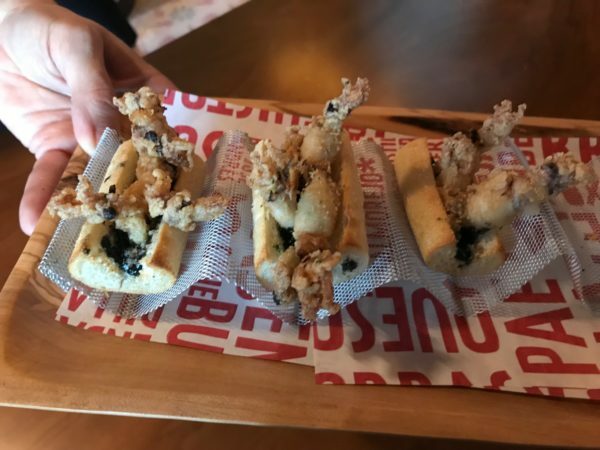 Since it’s his restaurant and he makes the rules, he has served his croquetas de pollo in shoes at all of this other restaurants. 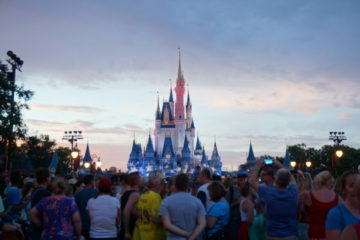 Disney wanted to put their own unique spin on this rule-breaking so they decided together to serve the fritters on Cinderella’s glass shoe pillow. 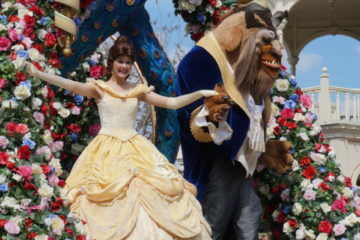 The croquetas de pollo is served on Cinderella’s glass slipper pillow! The meal isn’t over until you enjoy dessert, and Jaleo doesn’t disappoint. 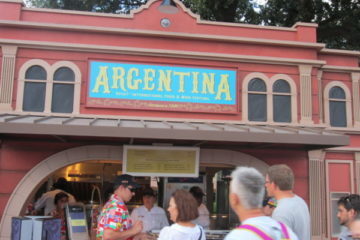 Options include traditional Spanish dishes and some with special twists. Quesada Asturiana: goat cheese cheesecake and seasonal sorbet). 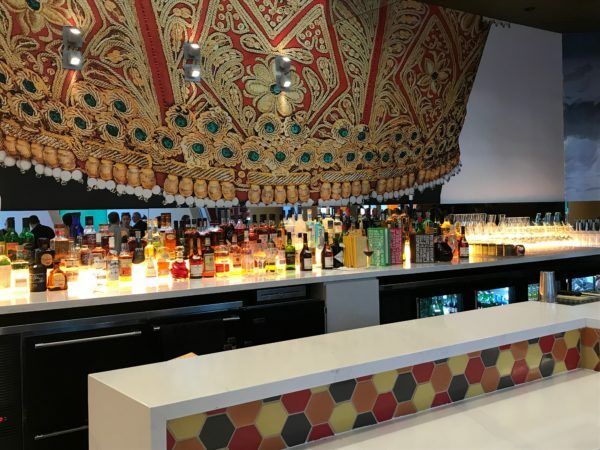 Will you try Jaleo on your next visit to Disney Springs?